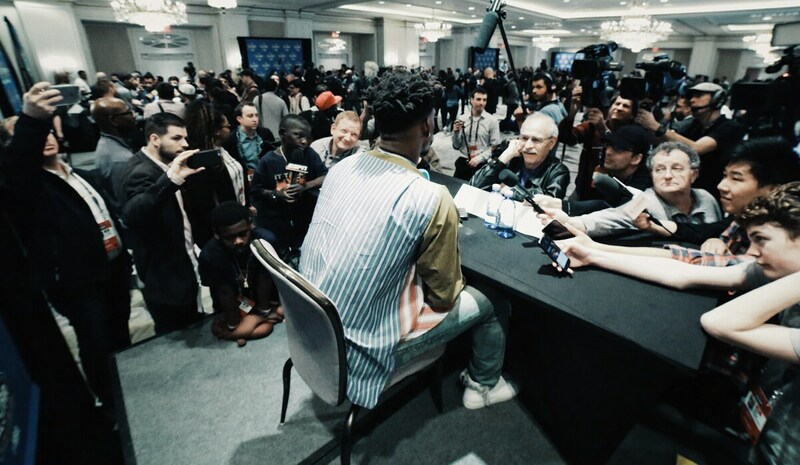 Jimmy Butler arrived to meet the media Friday in New Orleans for NBA All-Star weekend wrapped in symbolism. He was wearing a Stella McCartney shirt—you’d think, by the way, you’d at least get a Beatles record with it for what those things cost—of red and blue stripes with a swath of mustard. For the hot dog? Nah. There also was a large king of clubs layered into the fabric. Jimmy’s not quite the King, for LeBron still reigns in the NBA. But yes, Butler is getting himself in the line of succession and kind of the king of his club, the Bulls lone All-Star. And someone who truly belongs among the NBA’s elite. Butler will be at his third consecutive All-Star game, is starting for an East team with only two starters having been in more All-Star games and Kyrie Irving just one more. Plus, with the All-Star start and an Olympic gold medal last summer, Butler has moved into rarified Air in franchise history among the likes of only Michael Jordan and Scottie Pippen. They don’t make it an official title; you don’t get a business card that says Star, though LeBron may have one. 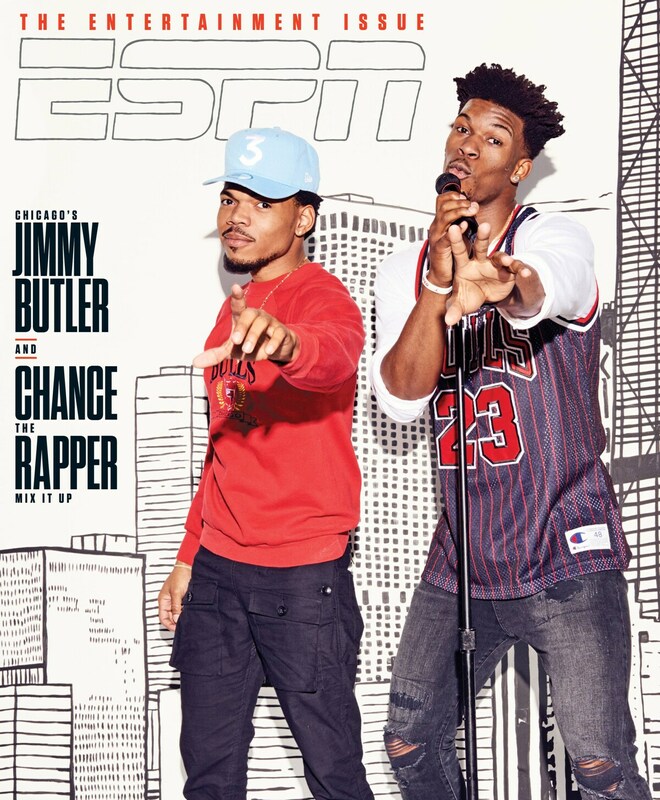 When Jimmy arrived this weekend, ESPN had him featured on the cover of their magazine with musician Chance the Rapper. He immediately went on the ESPN First Take show. Jimmy’s a star. Yes, Butler has somewhat officially made it, Olympic teammates with the best, one of the 10 starters with the voting now also by the players, perhaps even an MVP contender. The players often try to tilt the award to a home town player, which would be Anthony Davis for the West. The talking point for the game has been the much overblown feud between Kevin Durant and Russell Westbrook. Will West coach Steve Kerr have them in the lineup together? Will Russ trip him on a fast break? There’s not much game to discuss anymore for All-star games, the competition even further deteriorating last year into even less defense and more all oop dunks right even through the waning minutes of the fourth quarter. "A lot of fun, a lot of smiles that you don’t get in a normal NBA game because it’s so competitive every night. You get to share what you have in common in each locker room and then four days after the game you are back to being enemies, so to speak." Butler hasn’t played much in his two previous All-Star appearances, sitting out last year and a team low nine minutes in his first game in 2015. "I'm always nicked up right before," he said. "I want to play. Damn, this is what all the hard work, all that playing in the first part of the season; this is how you get rewarded. I want to compete against the best even though it's a different type of game than a normal NBA game. I’ve watched and played in it a little bit. I know the gist. Don't go out there trying to guard people 94 feet. This time he’s ready even with the 40 minutes in Thursday’s win over the Boston Celtics. Which given the proximity, some 14 hours before Butler was with reporters in New Orleans, the questions came fast Friday about that last play and foul, Butler’s two free throws winning the game. The NBA’s report on the last two minutes of contested games confirmed the foul call was correct for Marcus Smart’s touch of Butler’s elbow. “A foul is a foul,” Butler reiterated. “Everyone keeps asking me if he fouled me or not, the call. I hit you on the elbow when you are shooting a jump shot and you miss, it’s a foul. You can’t knock that it was a foul. Was it a ticky tack foul, yes, I would have made it, I believe, if he didn’t hit me. But he does get to the free throw line a lot, which is less the falsity of bias for stars than the fact that stars take the initiative. Like Butler does. Butler ran the gamut in 30 minutes with media Friday of the sublime and mundane, heavy on the mundane. There was a hello to Japan, a Brazilian inquiry on Cristiano Felicio, whom Butler celebrated, though admitted he still wasn’t sure how to pronounce his name. There was the little kid doing ESPN interviews asking about Jimmy’s pregame snack, which he said was chicken and rice. That’s a snack? No wonder he ripples. Butler had praised Kyrie Irving earlier in the day on the ESPN TV show as the kind of teammate—no offense to current guys—he’d like. Butler similarly mentioned DeAndre Jordan as the dunk favorite, and did admit he is closest with Jordan and Irving. But, no, he’s not coming to the Bulls and Butler isn’t going to the Cavs, and probably nowhere, though Butler’s name is among perhaps a half dozen All-Stars in trade rumors, if not reality. Good life advice as well. Though mostly Butler had fun with the interviews, asking a reporter wearing a Boston Celtics shirt and seeking praise for Isaiah Thomas why he and others weren’t asking Isaiah about him. He laughed about reporters coming and going asking about, “The Foul!” That’s the news? He admitted he hadn’t thought about getting Michael Jordan a birthday gift Friday on Jordan’s 54th, which Butler says he should have as Jordan is a close advisor. “Thanks for putting me on the spot,” Butler quipped. He also parried a question about since he’s emerged as the Bulls best player they have struggled to be around .500. 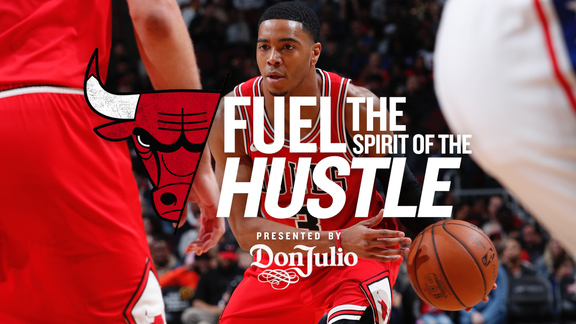 Butler also was positive about the Bulls chances. 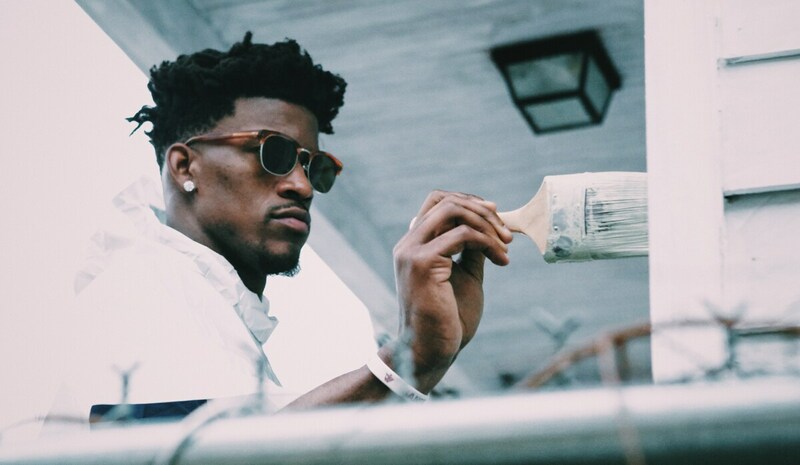 Butler also talked about Chance the Rapper, the Chicago artist with whom he appeared on the magazine cover. 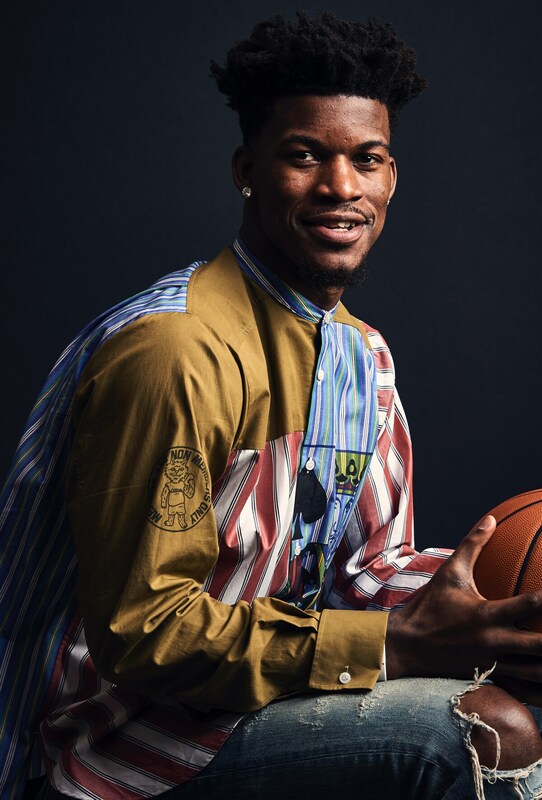 Butler deftly parried questions about his engagement with coach Fred Hoiberg last season and relationship with former coach Tom Thibodeau. Because he knows. This is a pretty right time for Butler, who can see a 40-foot high mural of himself in downtown New Orleans, and has to have difficulty envisioning all of this. “I never thought this was in the cards for me,” Butler concedes. “Make the most of it and it’s fun, but now that I’m here I have to keep working this dream. It’s an honor all your hard work is paying off. You look around here and see all of these great players in the game right now and for a kid like me growing up it’s a dream, being here; you are with the best and that puts a smile on your face. "Whether I am an all star starter, reserve, just being in the NBA I say I get to do what I love every single day. To make you mark in a big time city like Chicago, I’m just fortunate enough to get out there and be healthy enough to play basketball. I think you made it in your profession as soon as you enter the NBA; you have to be good to get there. That’s probably why you are not there." OK, that’s it. Gloves off. So what’s with the shirt? Hey, he’s the star. Everything looks good when you are the star.